Estadio Coliseum Alfonso Pérez is the home stadium of Getafe CF, replacing the formerly used Estadio de las Margaritas in 1998, giving the club it’s current capacity of 17,700. Getafe president Ángel Torres recently wanted to upgrade the coliseum’s facilities but poor crowd averages have put this potential development on hold. On the 30th of August 1998, Coliseum Alfonso Pérez held Getafe’s inaugural match against Tavares which the Azulones (The Deep Blues) lost by a single goal, with the final score being 1 nil to the visitors. Following a period of relative success in the 1980s and 1990s, the club needed a larger, and more modern set of facilities to accommodate their burgeoning fan base and it was with regret that Estadio Las Margaritas wasn’t capable of providing this any more. 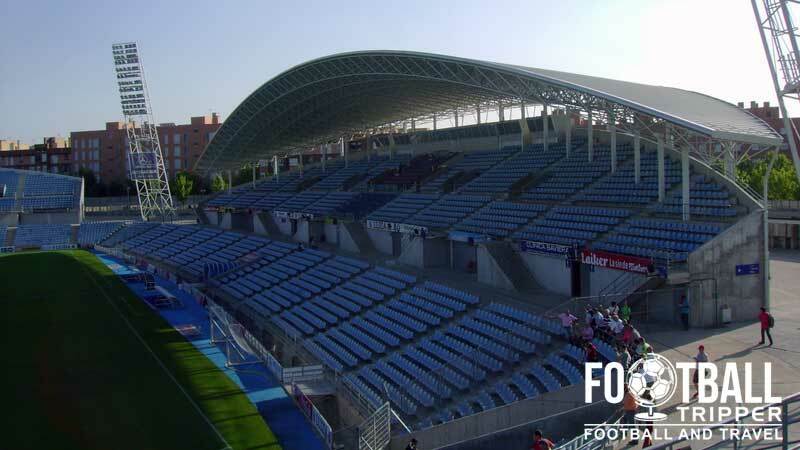 Ironically, fans of Getafe have never really taken to the Nuevo Estadio with a refurbishment in 2004 upon the team’s promotion to the Primera División in 2004 seen as an attempt by the club to remedy the fan’s concerns about the feel of the stands. Still, it seems the concerns and feelings towards Coliseum Alfonso Pérez are still at best ambivalent, with management seeking a move to a new stadium if not for the global financial crisis of 2007-2008. For now fans will have to make do with the facilities – after all they can’t be awful if UEFA decided to hold the Women’s Champions League final in 2010 at the Coliseum. Alfonso Pérez is divided into four stands: Fondo Norte, Este Cubierta, Graderia Sur and Tribuna (West). When away fans do make the effort to turn up they are usually housed within one or two sections of seating towards the within the lower tier of the northern stand’s. Situated towards the western stand, views from this away area are generally adequate but fans often complain of expensive ticket prices bordering €40.00 for a match between two average teams! Estadio Coliseum Alfonso Pérez is located in Getafe Norte which is southern neighbourhood of Madrid, what some might call a few km out of town. As part of a recent construction program, the stadium lies between a mix of residential housing and commercial property which such as the “Boulevard Shopping Centre” which has a Carrefour Supermarket, and plenty of restaurants and bars. There is no information regarding location and opening times of shops on the Getafe website but you can safely assume that you will be able to buy merchandise of Azulones (The Deep Blues) on the day of the match. Failing this you can opt to purchase at the official online store here. The exterior of Getafe’s club shop as it undergoes slightly rennovation work on its exterior. 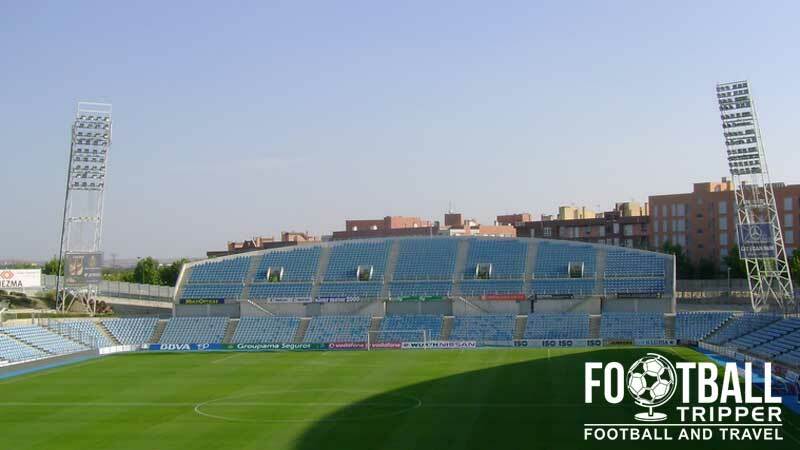 There doesn’t appear to be any tours of Coliseum Alfonso Pérez open to the general public, with your best best simple being attending a match and having a walk around. Even though it was constructed in 1998, the design comes across as very utilitarian; 4 concrete stands with a lack of unnecessary flair, which comes across as almost a bucolic. 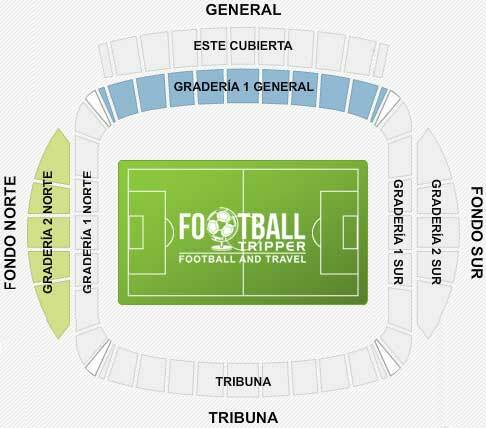 Tickets to see Getafe play can be purchased via the usual Spanish channels including online from the official website, at the stadium itself (Taquillas – Ticket Windows). Ticket prices for Getafe are hard to predict as the cost depends on factors such as demand (who they’re playing) and where you wish to sit in the stadium. Some fan sights estimate that you will probably have to pay around €25-30.00 for a seat behind the goal and a maximum of €70.00 for a seat along the main stand. Coliseum/Estadio Alfonso Pérez is located in the Getafe suburb of the Madrid Metropolitan area which is around 12km South of the city centre in the Manzanares River basin. The leafy exterior of Coliseum Alfonso Perez, walking from the city centre certainly isn’t practical as it will take upwards of 2 hours. Estadi Alfonso Pérez is tucked between the avenue Teresa de Calcuta and the M-45 motorway which makes it a very easy place to drive to either from Madrid or further afield. 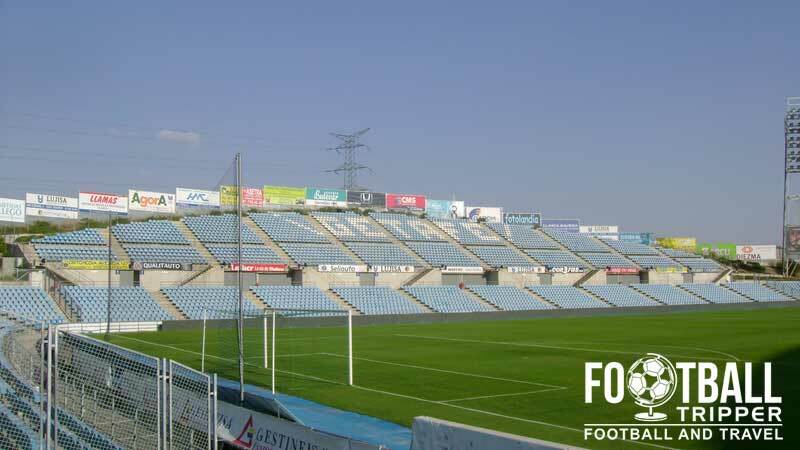 Visible from the motorway, follow exit signs for Getafe and let your satnav do the rest. There is a medium sized car-park located west of the ground which is available for the general public to use on matchdays for the cost of a few euros. At a glance I’d say there is around 500 spaces however, no official figure has been released and it still pays to get there early. As a back up you could also try parking a the Centro Comercial Bulevar Getafe 2 minutes further down the road. From Atocha Cercanía station you can catch a 20 minute commuter train south towards Parla/Sol which will leave you around 18 minute walk away from the stadium. The stop you will want to get off at is called Las Margaritas Universidad, and trains depart every 15-25 minutes depending on the day. This line is known as C-4. The metro is also an option depending on your starting point with Los Espartales being an unbeatable 5 minute walk away from the stadium. To get off here, catch the circular line 12 (Metrosur), but in order to do this you will have to make your way to Puerta Del Sur station which is on Line 10 so that you can transfer. The metro probably takes just under an hour and has way more stops than a direct commuter train, but in it’s defence, it does take you closer to the stadium. Use your judgement of what you want to do! There is an airport in Getafe but unfortunately it is strictly military. The nearest commercial airport is the Adolfo Suárez Madrid-Barajas airport which is the 6th busiest in Europe. Located over 25km away from Coliseum Alfonso Pérez, you can reach the airport either via the M-45/40 motorway or by using the Madrid metro line which takes you to Nuevos Ministerios station. The suburb of Getafe itself has a dozen or so hotel options such as Hotel Ibis Madrid Getafe, El Asador de Enrique and Hesperia Getafe. 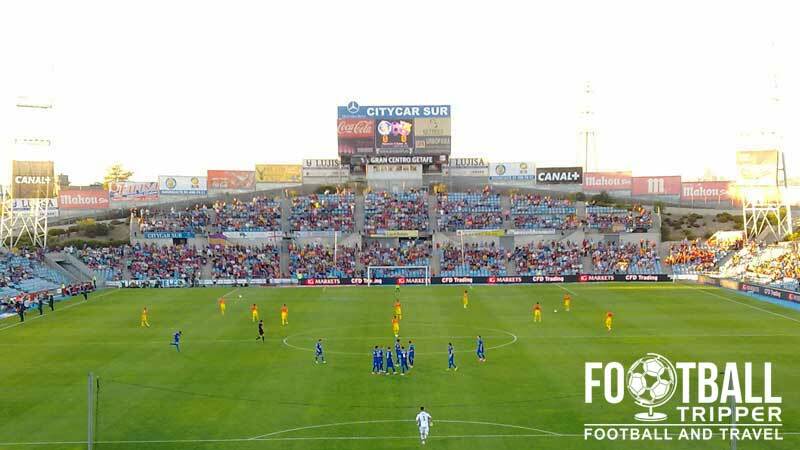 Depending on whether or not the purpose of your trip is to solely see Getafe in action or you are visiting Madrid and want to take in a game, you’ll probably want to head back to the city centre for much more choice. There are lots of hotel choices near Madrid-Atocha Cercanias metro station which can use to get to the stadium with AC Hotel Carlton Madrid by Marriott and NH Sur being two potential choices.